Both Angry Video Game Nerd platforming titles are being re-released on consoles as The Angry Video Game Nerd: I & II Deluxe, it has been confirmed. Centred around the online, mature-themed comedy series of the same name, both titles are 2D platformers where, as the Nerd, you're tasked with blasting your way through each level with a NES Zapper. 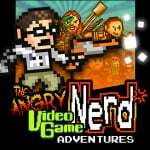 The first game, Angry Video Game Nerd Adventures, actually arrived on Wii U and 3DS back in 2015 after its original launch on steam, but the sequel, The Angry Video Game Nerd Adventures II: ASSimilation, didn't make it to consoles. Specific platforms for the bundle haven't yet been announced, although FreakZone's responses to replies left by fans would suggest that a Switch version is almost certainly on the way. One such reply states "we know what you all want. I’m not allowed to answer questions on which consoles yet but I think people will be very happy", while another response says "I think it's clear where the nerd belongs". Naturally, all other details specific to this bundle are also still rather thin on the ground, but feel free to check out our reviews of the 3DS and Wii U versions of the original title for more info. Would you like to see the bundle arrive on Switch? Have you played either of the two games before? Let us know in the comments below. Owning the first Wii U entry, I would have bought just the second one on the switch, but this is good news nonetheless... Definetely checking out for more info! Oh, neat. I still have the first game on 3DS but have never actually played it, despite the intention to. Would be even cooler if this can get a physical release. Nice. Can't wait to try it! Love these games and can't wait for them on Switch also @ryancraddock there is a 3rd bonus chapter included in the package. Playing 2nd game right now, it's much easier than first one, but just as great. The soundtrack is masterpiece. I played the first one and it was hilarious! Fantastic news. I played the original on the 3DS and it was hilarious and very, very difficult. Looking forward to this release! Really enjoyed the first one, glad I'll finally be able to give the 2nd one a go. I always get a chuckle whenever I read about 'mature' ratings about these sort of things. Does anyone know if hes still around doing videos? Have the first game but not played it yet. Never knew there was a sequel. What a s**tload of f***! Seriously, this is great news. James is the man. Well, I'll say this: yeah, the first AVGNA was a rage game, but an excellent and fair rage game at that. At the easiest difficulty, it's as rewarding as any Dark Souls game. So yeah, I'll be glad to give FZ Games more money when the time comes. I hope the final boss of the second game is the Irate Gamer. Make it so rival could fight each other. Sweet, I was wondering how long until these were ported over. These are great parodies of 'NES hard' games. Will definitely get these on Switch. From a business perspective, I gotta respect the guy for embracing YouTube almost from the very beginning ages ago. Most people just weren't taking the platform very seriously back then. Look where he is now, all thanks to quality and consistency. Cool! I have the first game on both Steam and 3DS, but was holding off on the second game on the hopes it would get a Switch release. I'll pick this collection up for sure (unless it's ridiculously priced, then i'll just wait for a possible sale). I see Mr. Bucket on the cover. That wasn't an AVGN character, that was Board James. But close enough I suppose. I'm Mr. Bucket! Balls pop out of my mouth! I'm Mr. Bucket! We're all gonna run! I'm Mr. Bucket! Buckets of fun! neat, will have to get it on PC or Switch. I have followed AVGN for nearly a decade at this point. I have to imagine he is incredibly happy to hear this. If the second one hits the Switch someday, I would love to download it someday. I didn't know it was only released on pc though. As someone who has played and beaten the original many times across several PC's and the 3DS Version and has also beaten the second game on PC. I'm really looking forward to this game's release. Hopefully, it will be brought over to the Switch as the controls for the Switch would be perfect for a game like this.